Learning a foreign language comes more naturally to some people than others. Sure, the best solution is usually immersion. Short of that, one of the next best approaches is to study on your own—and why not do it on your Mac? Fairfield Language Technologies’ Rosetta Stone 3.0 provides a comprehensive way to learn a foreign language. It teaches reading, writing, and verbal comprehension. It also includes photos to help you associate the new foreign words with images instead of relying on translations between English and the new language. Its interface is easy to use and will reinforce the lessons. This latest version has been revised to work smoothly with Mac OS X, and the company recently released a version of the software that teaches Farsi (Persian), which I tested, along with the French edition. All of Rosetta Stone’s language lessons start out the same way. The first lesson begins with simple words such as “boy,” “girl,” “cat” and “dog.” In the first exercise, the program speaks the new language’s word for “a boy,” writes it across the top of the screen, and displays one of four images to choose from. When you choose the correct image on the first try, the program awards you four points. When you get it right on the second try, the program awards you three points, and so forth. Each time you choose the correct picture, the pictures will rotate and you will be asked to choose a new picture. Rosetta Stone lets you choose the format you’d like to practice within each lesson. 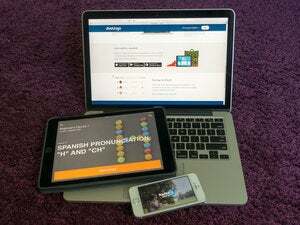 You can move through each lesson using one of four setups: spoken text with four photos to choose from, a photo and four spoken words to choose from, a photo and four written texts to choose from, or a written text and four spoken words to choose from. These varied methods allow you to practice verbal, listening, and reading comprehension. The program continues in this pattern, expanding eventually to personal pronouns, present and past tense, and numbers. Rosetta Stone builds on previous lessons, incorporating words and phrases from one lesson to the next. By reinforcing the past lessons, it’s easier to learn and remember specific words or phrases. You can also choose to time yourself on the exercises when you think you’re up to the challenge. Like most language textbooks, Rosetta Stone focuses more on formal speech than on native speakers’ common ways of using the language. The program sometimes uses words that native speakers would understand, but would not frequently use. For example, the word Rosetta Stone gives for “car” in the Persian version is khodrow , though the more common word is maasheen . Rosetta Stone would be more effective if it customized each language’s lessons to the cultures in which the language is spoken. For example, before the user learns the word for “airplane” ( havapayma ) in Farsi, which is introduced in the second screen, it would be more useful to learn the words for certain common Persian foods, such as “bread” ( noon ), “tea” ( chayee ), or even “water” ( aahb ). Plus, it also would help to remove words from the early lessons that aren’t culturally relevant, such as “elephant.” There aren’t too many elephants in Iran or France. A spokesperson for Fairfield Language Technologies said that the company divided their picture sets into four categories: Western, Latin, Swahili, and Asian. For some reason, Farsi, Polish and Welsh all use the Western picture set, meaning the photographs are the same. The learning experience would be more authentic if the photographs were taken in the country whose language is being taught. Rosetta Stone 3.0 provides an easy and well-organized way to learn a language using your Mac. If you’re looking for a quick and dirty phrasebook before you head off on vacation, Rosetta Stone isn’t for you. But if you’re willing to really dig in and spend time learning a foreign language, Rosetta Stone can provide a strong foundation. The opening screen of Rosetta Stone Farsi shows the four images: a girl, a boy, a dog and a cat. Here, the program is prompting the user to select the correct image of yek gorbeh (a cat).